This was supposed to taste like orange? Summary : Not a bad tasting tea from Culinary Teas , but nowhere could I find even a hint of orange. Not a "orange lovers tea," that is for sure. Review : If a tea has the label "orange" on it I'll likely fall in love with the tea before even trying it. 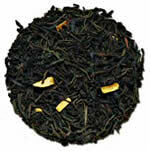 And so was the case with Culinary Teas Orange Tea, a flavored black tea. Indeed, even on their website, this tea is supposed to taste like a "orange popscile" - thus making this tea seem like a sweet tooth lovers delight. And so I was very saddened when I opened up the air-tight bag that all of their teas come in. I was greeted not by the sweet smell of oranges, but instead, well, there really wasn't much of a smell at all. Yet, a tea can't be judged by the smell alone, so off I went to brew the tea. And sadly, the taste of the tea more or less matched the smell. It's not that the tea tasted bad - it's just that the tea tasted like a typical black tea, sort of a "different" orange spiced tea. So, who will like this tea. Well, not me for starters. And if you are searching for a "orange tea", let alone one that actually tastes like an orange popscile, well, keep searching. However, if you like a more traditional black tea - such as an earl grey tea, I suspect you'll likely enjoy this tea to some degree. I really didn't mind this tea - it's just that I was hoping for a ORANGE tasting tea and all I got was this black tea with no hint whatsoever of oranges. Recommendation : If searching for a "orange tasting" tea then this one is not for you, despite the misleading label and website description. Tastes more like a traditional black tea. Brewing Instructions : Use 2 tsp of leaf per cup. Pour boiling water over the leaves. Let brew for 3-5 minutes. I found very little taste difference between the 3 minute and 5 minute brewing times. The leaves GREATLY expand during the brewing process.